Are you sick of me talking about Cape Cod yet? If yes, I’m #sorrynotsorry… The thing is, we kind of live for this annual retreat from reality, and I honestly don’t know how people who don’t have a tradition like this stay sane throughout the year. This will be my last post on the topic – promise! (Until next summer, that is). As mentioned last week, this tradition was conceived nearly twenty years ago (!!!) by Rene’s aunt and her college friends – all of whom immigrated to the US from Poland around the same time in the late eighties/early nineties. All of their kids (Rene included) grew up camping on the Cape, and now that the kids are all grown up, their boyfriends/girlfriends (like me!) are regulars, too. Each year we overtake a large corner of the campground to ourselves, which we [only slightly obnoxiously] mark by hanging a Polish flag with a rope on a tree. Our home for the week becomes a mess of wifes and husbands, boyfriends and girlfriends, and parents and kids, clouded by a constant hum of a language that sounds like a bunch of pshze-pshze-pshze’s if you don’t know what to listen for. One of the best parts of the week are the communal breakfasts. Everyone contributes whatever they have in the cooler that day – be it a wedge of Brie, juicy heirloom tomatoes, kielbasa (transported all the way from Greenpoint, thank you very much) that gets fried until golden brown, or a box of pains au chocolat picked up at a nearby town. About halfway through this year’s trip, I realized that we still haven’t had a single communal breakfast. It was a gray rainy day, there was about ten of us at the campsite, and I took it upon myself to gather us at the picnic table. The pickings were slim. A couple of summer squashes and bell peppers, three-quarters of a sourdough boule, garlic, sun-dried tomatoes, a jar of ground turmeric, and a block of tofu were all I was able to recover from the coolers. 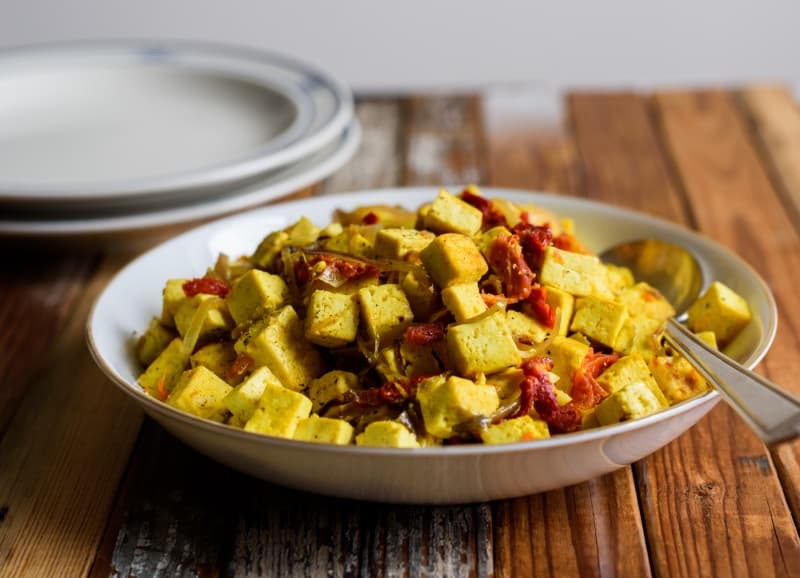 After standing there scratching my head for a few of minutes, I figured I’d saute the vegetables with garlic, pan-fry thick slices of bread in olive oil, and cook the tofu with garlic, sun-dried tomatoes and turmeric. I don’t know if it was the rain outside the walls of our gazebo, the tall French press with freshly brewed coffee, or that visceral satisfaction of feeding others, but that morning turned out to be one of my favorite moments of the whole trip. On to the recipe: I’d never made tofu like this before but everyone loved it. 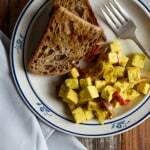 This breakfast tofu recipe has the look and feel of a tofu scramble (the vegan answer to scrambled eggs), but without the direct comparison, which risks making the tofu the inherently inferior hippie option. The recipe comes together quickly and doesn’t require any fancy techniques or equipment, which makes it a great way to introduce this high-protein ingredient to those of you who may be intimidated or turned off by it. Remember to look for the USDA Organic and Non-GMO Project Verified labels on your tofu package to ensure you’re getting the best quality product. 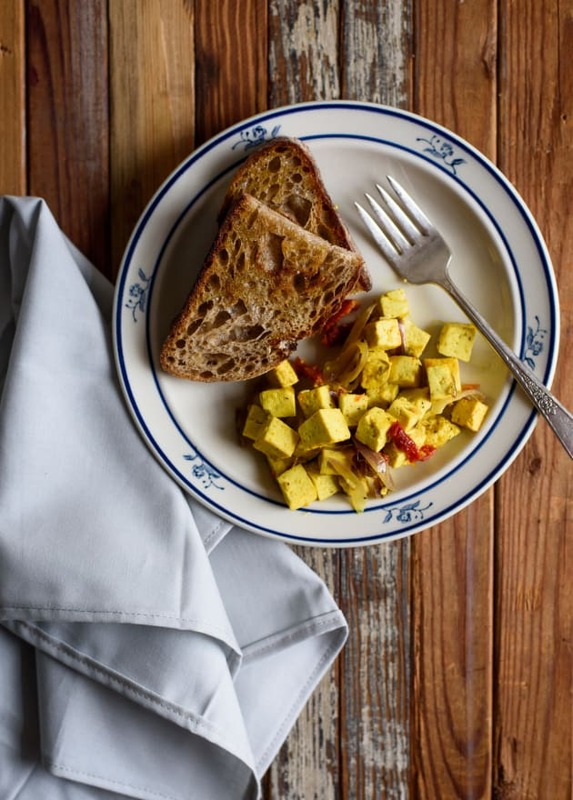 This breakfast tofu recipe has the look and feel of a tofu scramble (the vegan answer to scrambled eggs), but without the direct comparison, which risks making the tofu the inherently inferior hippie option. Remember to look for the USDA Organic and Non-GMO Project Verified labels on your tofu package to ensure you’re getting the best quality product. Here you may use both oil-packed or dry sun-dried tomatoes; if using the dry variety, soak them in hot water for 5 minutes before slicing. Heat the oil in a medium saucepan over medium heat. Add the onion and pepper flakes, and cook for 1 minute. 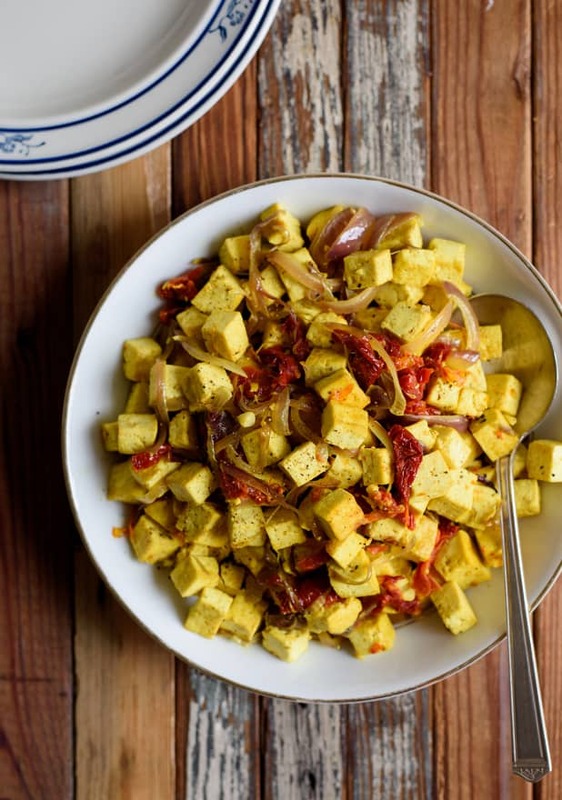 Add the tofu, salt, turmeric, and pepper, and stir to coat evenly. Cook for 5 minutes, stirring occasionally, until the tofu is warmed through and starting to brown. Stir in the tomatoes and garlic, and cook for another minute. Turn the heat off, taste, and adjust the seasonings if needed. Serve with pan-fried whole wheat sourdough and a green salad if desired.